What are some of your bullet journal goals? Why did you start a bullet journal or why are you thinking of starting one? It may be to simply keep track of your life but did you know that a bullet journal is an awesome tool to use to achieve your goals? This nifty little planner is more than just a cute list of to-do items and appointments, it can also help you to win at life. If you’re clueless about what a bullet journal is and how it differs from a planner, read this post on starting a bullet journal. Then come back and learn how you can use is to finally achieve those pesky new year’s resolutions that keep going back on the list every year plus all your other goals in between. Here are some ways to use a bullet journal to achieve different types of goals you may have. And if you need a new bullet journal be sure to grab this one, it’s the best on the market! To start your new bullet journal goals system, begin with your short-term ones. This includes what needs to be done on a daily and weekly basis. Writing your goals in your bullet journal along with all your daily to-dos and appointments keeps them close to you at all times. 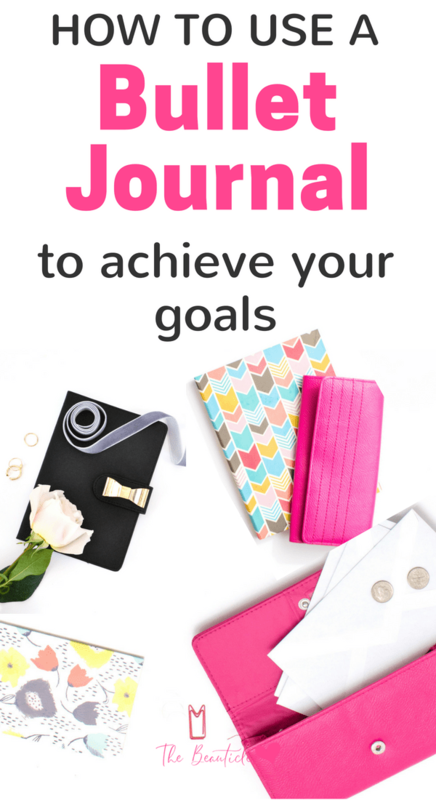 For example, if every time you open your bullet journal you see your goal of losing 2lbs per week, you will be more motivated to put in your 10,000 steps every day to help you achieve that goal. A daily goal would then be to put in 10,000 steps every day. Each Sunday, think of everything you need to achieve by next Sunday and write them in your weekly list. Leave space for those that pop up during the week that also need to be done before the week is out. Next, you’ll want to begin including anything related to your job and your finances, or a business you might be trying to start. These can be both short-term and long-term goals. You may be trying to work up the courage to ask for a raise or get your finances in order, which are short-term goals. However, some long-term goals might be saving a certain amount of money for retirement or advancing your career. 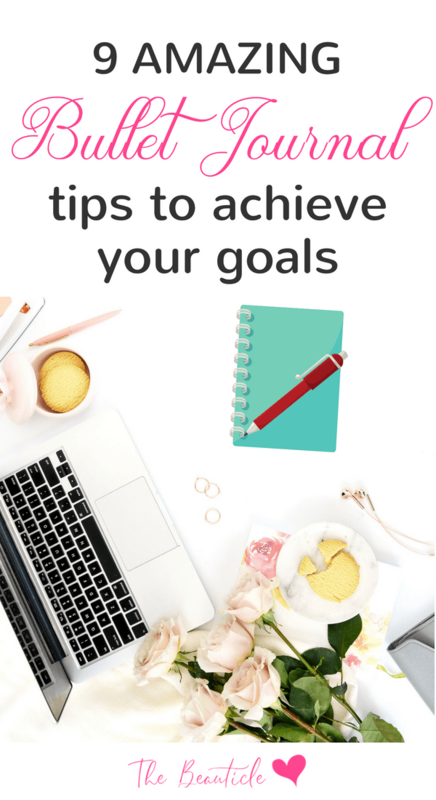 Along with simply listing your long-term goals, be sure to start thinking about any action that you can take in the short term to achieve your goal and include it in your shorter term lists. Include some goals related to your family and any traveling you want to do. Perhaps you have a page dedicated to some family notes, goals like a conversation you want to have with your kids, teaching your teenager to drive, or eventually visiting Disneyworld with the kids. If you don’t have a 5-year plan, now is the time to start one! This gives you an idea of where you want to be in five years and then includes the actions you need to take in order to get there. Think about your home, lifestyle, health, family, work, and finances and where you think you want to be in five years. You might want to be finished with college, change careers, have a baby, or have a certain amount of money in the bank. This is where you will add these types of goals to create your plan, then come up with a way to achieve the goals. Your bullet journal can also have your goals in the form of a bucket list. This is a great way to include tings that aren’t necessarily tasks related to work, family, or finances, but more of long-term goals and dreams you have in mind. Think of things that wouldn’t go in ordinary to-do lists, such as someday moving to a downtown city loft or living in Europe for a year. They aren’t things you think are impossible, but more life goals as opposed to something that has to be done right now. Let’s break down creating a bucket list in your bullet journal even more. Bucket lists can get quite long and you will likely be adding to it for a while, so make sure you don’t just have it on a single page. It helps to dedicate several pages of your bullet journal to the bucket list, including front and back spaces. Think about how much you might want to actually do in the future, and you can imagine how much room you will need. You can always add in more pages later, but saving them now helps to keep it better organized. Don’t feel like you need to create the entire list now. It is not like a to-do list where you need to know all the important tasks at one time. It should be slow and gradual, something you are consistently adding to as you think of things. Today, just start the list and give it a few things you would like to accomplish in your lifetime. It can be anything, big or small, that you feel would be an ultimate life goal. You may also want to split up your bucket list into different categories, especially if you have a lot of different areas of your life where goals exist. For example, you can have a family section that includes getting married and having children, a travel section with the different places you would like to see and visit, and personal goals like a major fitness goal to be added. Sometimes it is hard to think of what should go on your list, so you have a peek at other bucket lists. There is absolutely nothing wrong with that. It makes sense that more than one people have a similar goal. This exercise will help you to get to know yourself better and what your tastes are by what you’re called to and what you discard when looking at other lists. While the bucket list doesn’t have to include things within your reach, it gets it going and motivates you when you can have at least one thing you are able to accomplish soon. For example, if you have never eaten an octopus or asked someone out on a date that you haven’t met, these are things that might seem scary, but definitely something you can do soon. Go ahead and add them! There are several other ways to use your bullet journal of course and you’ll benefit from having one and using it regularly. If you’re wondering why else you may want to start a bullet journal, here are some other benefits to having one around. Bullet journals provide an easy way to track all of your thoughts, feelings, appointments, and goals for your life, whether for today, next week, or 10 years from now. These are just a few of the benefits of a bullet journal. You can also become a more organized person with the help of a bullet journal. Perhaps you’re fine with getting to work on time and bringing your kids to their dentist appointments, but you tend to forget about your daily fitness regimen or don’t feel organized enough for meal planning. The bullet journal can help with these tasks and much more. Planners are great, but there tend to be some limitations with the store-bought varieties. They aren’t very customizable, so you are forced to use whatever calendar layouts and note pages are provided to you. This limits you to how much you can include on each page and what sections there are. Bullet journals can give you a better idea of what your personal goals are and what is required to reach those goals. When you look back on your goals set and those achieved and not achieved it really gives you a good idea of what you want out of life and what tasks you need to do in order to achieve them. It also reveals what tasks you’re just not motivated to do and can show you new areas of life you may want to explore in exchange for old goals. This can reveal anything you need to change in your habits in order to achieve your goals. This can also help you greatly with your personal finances. Click here for exactly how a bullet journal helps with money goals. These goal-setting spreads are inspirational and can help you to decide how you may want to set up your bullet journal to begin achieving your goals.